Vladimir Nabokov spent most of his life researching, collecting and studying butterflies. He was actually so interested in it that he could have pursued a career as a researcher if writing had not become so successful. He spent countless days of his childhood hiking around St. Petersburg and Crimea looking for different species of moths and butterflies that he captured and analyzed obsessively. Hundreds of drawings exist, illustrating wings, patterns and body shapes to great detail. His biggest dream was to discover new species, which he did, upstate New York, later in his life. 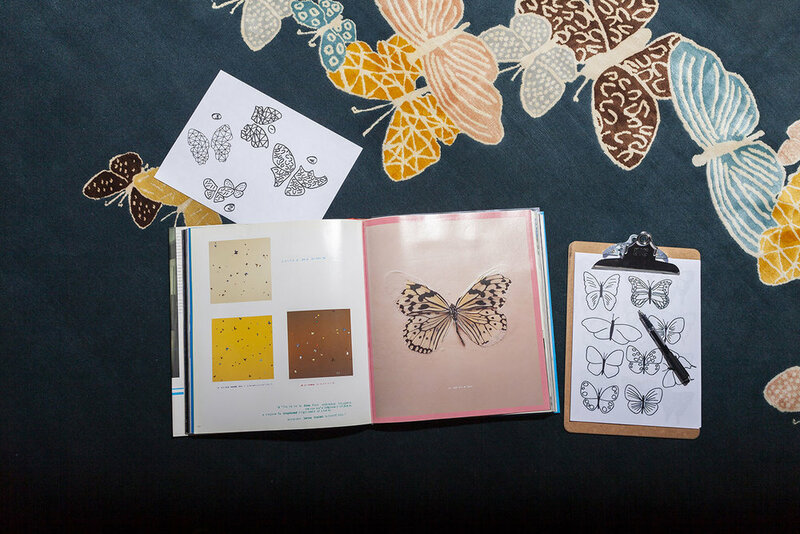 Damien Hirst had a similar fascination with butterflies but he was less interested in studying them and more in exploring the idea of death (most butterflies live as little as four weeks). “In and Out of Love” from 1991 is said to have used more than 9000 butterflies that ended up dying in the room or where pinned to the canvases. I guess we have some sort of an obsession with these beautiful creatures, maybe because of their brief lifespan. It is like we want to preserve beauty forever, like a cry at our own mortality. I don’t know why I started drawing butterflies, it could be because I saw them around on fashion items, or maybe because they stayed in me from the Alexander McQueen hats… I don’t know for sure but my butterflies have not been captured and glued on a painting or a vitrine, they live special lives in a world of their own. They are the direct expression of my inner thoughts into paper. Their patterns are my pattern and they live forever. Designing a rug is creating a new world detached from the physical one, a parallel universe where different laws apply: you step in it and you are transported into a different reality. When a kid plays with his own toys, barbies, superheroes and action figures, he infuses life on the toys; when I draw, the same magic happens on the paper and that’s what happened the day I started sketching wings on my notebook. I imagined these creatures taking a life of their own and flying away. I imagined them interacting, playing and multiplying. 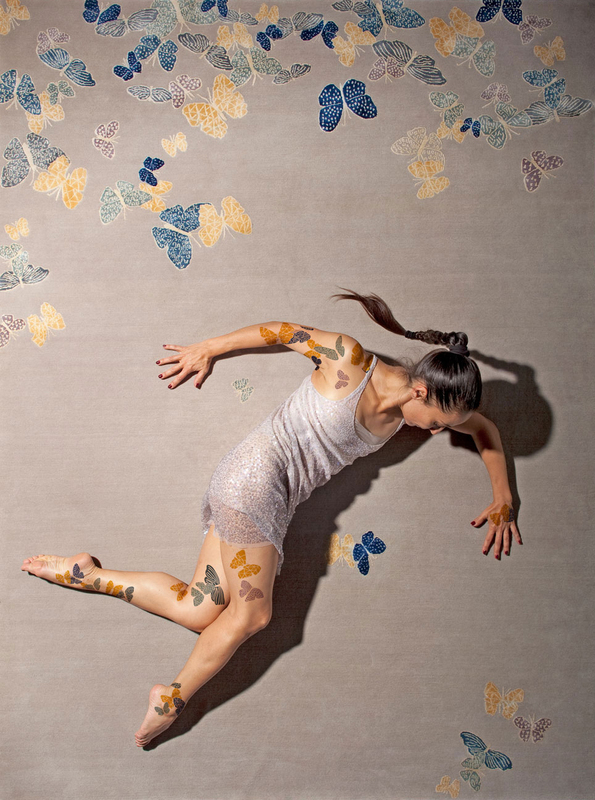 I imagined for them the most beautiful patterns and colors and then slowly these rugs came alive. Spirit in the Night Sky. 8 feet rug, 150 knot quality, 100% wool and Silk. Handmade in Nepal. Contact us for shipping quotes, different sizes, patterns, and colors.